I had the misfortune to be aboard this Saxon when it ran over a TMA3 blast anti-tank mine in the hills above Rama Lake. 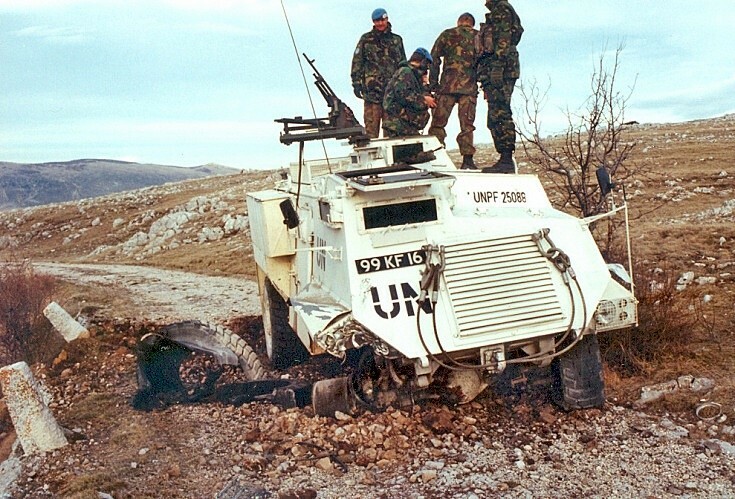 Still, it could have been worse, we could have been in a tracked Spartan APC with its flat bottom. There were several serious casualties and even fatalities when Spartans ran over this type of mine. The steeply sloped sides of the Saxon deflected the blast and we suffered one casualty, the "top cover" grazed his nose! Naturally I followed the immediate action drill and stayed in the vehicle until recovery came - not; I wasn't going to waste this photo opportunity. What a great "action" image. The shape/design of the hull on Saxon clearly paid off in the incident shown, saving the crew from injury. Added by Stephen Prosser on 03 February 2014.